Before the Great War, Newcastle upon Tyne in north east England was at its peak as one of the great industrial cities of the world, central to British coal mining, home to major locomotive builders and, biggest of all, heart of a thriving shipbuilding industry which, along the lower reaches of the River Tyne and the nearby River Wear, produced a third of the world’s ocean going ships. And none of these is as famous, as beautiful or as significant as RMS Mauretania. 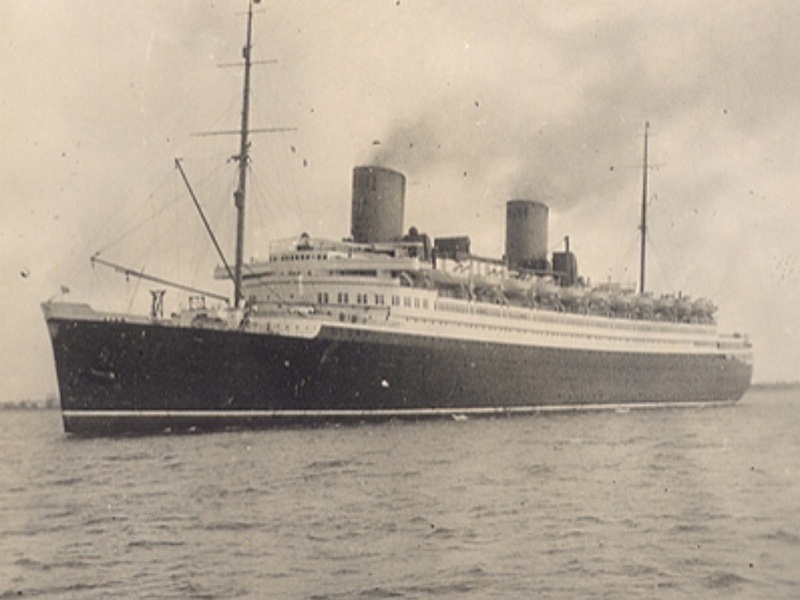 Mauretania was the result of competition between the British shipping line Cunard, the Anglo-American White Star Line and the Norddeutscher Lloyd (North German Lloyd, or NDL) line for the prestigious and profitable trans-Atlantic traffic. Cunard is the doyen of trans-Atlantic shipping lines, founded in Halifax, Nova Scotia, by Samuel Cunard in 1839 as the British and North American Royal Mail Steam-Packet Company before relocating to Liverpool in 1840. White Star was the younger, less stuffy company, and by 1902 was part of JP Morgan’s International Mercantile Marine conglomerate, and NDL was the vehicle for Germany’s desire to compete with and beat the British under the ambitious Kaisers. In 1900, Cunard’s key vessels were the Campania and Lucania of 1893 (until the Queen Mary of 1935, all Cunard ships had names ending –ia). 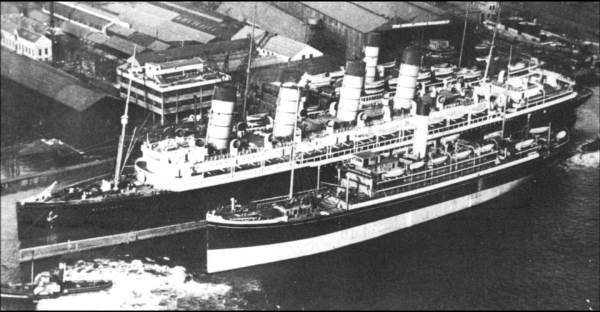 Campania and Lucania were 13,000 tons and over 600 feet long, and could accommodate 2,000 passengers and over 400 crew. Both had held the ‘Blue Riband’ for the fastest crossing of the Atlantic, but by 1897 NDL’s Kaiser Wilhelm der Grosse had taken their crown, with an average speed of 22.3 knots, beating the Campania’s record of 21.21 knots. 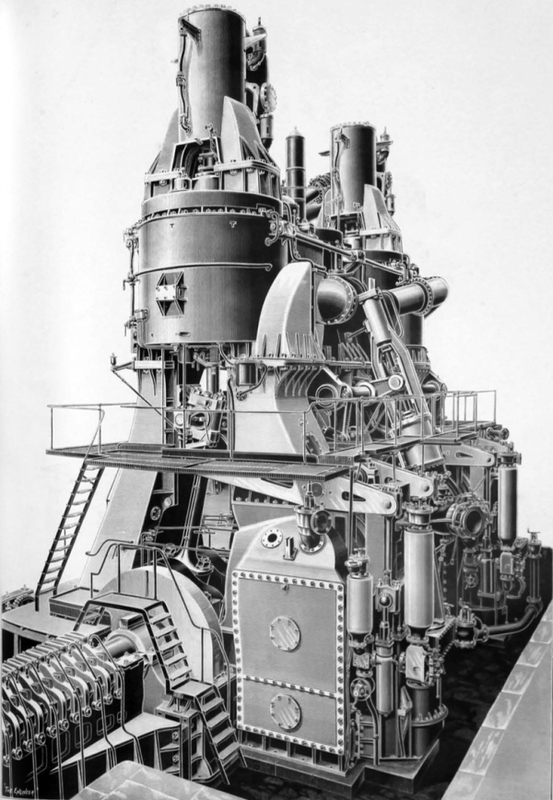 All these ships were powered by massive reciprocating steam engines, and it was apparent to all that this technology had reached its limit – the triple expansion engines on Campania were 47 feet high, and needed 12 boilers (with furnances stoked by hand!) 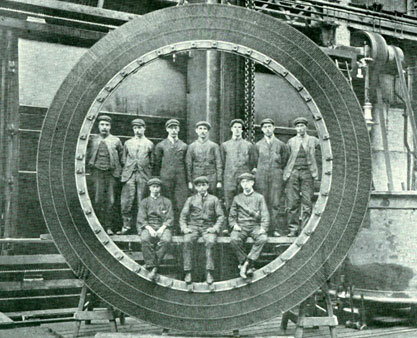 each 18 feet in diameter to provide the steam for cylinders up to 98 inch in diameter. 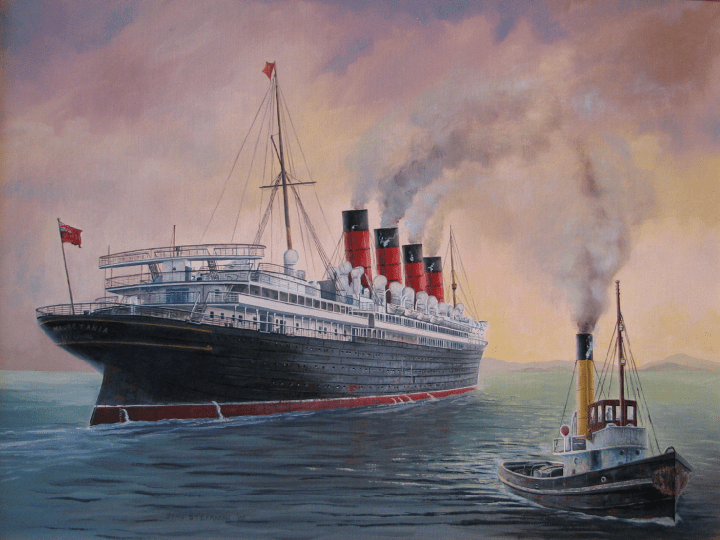 So a dilemma for Cunard – how to build something to beat the Germans? 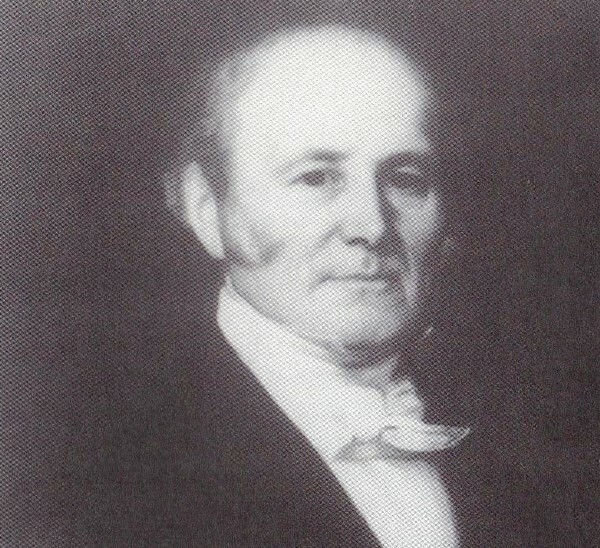 Charles Parsons, an engineer from an aristocratic Anglo-Irish family, had the answer – the steam turbine. 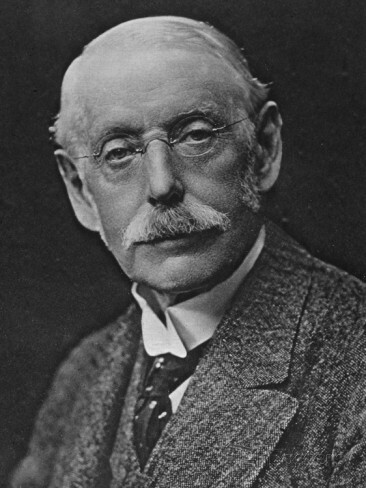 Parsons (1854-1931) was a mathematician by training who became an engineer by the unusual route, for a graduate of Trinity College Dublin and St John’s College Cambridge, of an apprenticeship with the famous Newcastle shipbuilding and armament company founded by William Armstrong. He then developed the idea of a steam turbine while working at ship engine builders Clarke Chapman, based in Gateshead on the south bank of the Tyne. The principle of a steam turbine is simple. Instead of the steam generated by a pressured boiler driving the cylinders of an engine, it is used to drive the blades of a turbine. The concept is simple, but the execution, compared to a reciprocating steam engine, is demanding, with high precision essential and requiring components able to withstand very high rotational speeds and temperatures. The advantages are several – much more compact, lighter, smoother, and more powerful, and with the ship’s propellers directly driven from the turbine shafts. They are ideal for ships and power generation, which need a smooth and economical engine able to generate a steady power output continuously for hours and days on end. Parsons first patented the turbine in 1884, and by 1888 about 200 were in use, mostly to generate electricity for use on-board ships. By 1890, the Forth Banks power station in Newcastle was the world’s first to generate power using a steam turbine. In 1893 Parsons formed the Marine Steam Turbine Company, later C A Parsons & Co, with a large and expanding factory in the Newcastle suburb of Heaton which is now (after a typically British tortuous corporate history) the C A Parsons Works of Siemens Power Generation. 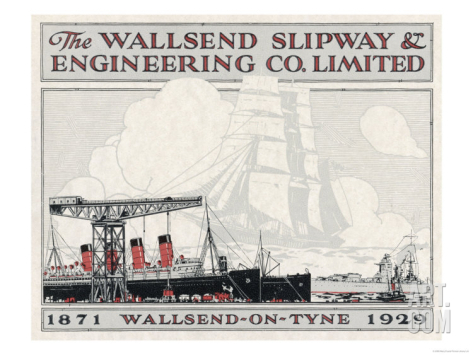 In 1894, at Wallsend, on the Tyne just outside Newcastle, Parsons completed Turbinia, the first turbine powered ship in the world. She was also the fastest ship in the world, capable of 35 knots, albeit a small one – 45 tons and 100ft long. In 1897, in an outrageous piece of attention grabbing that wouldn’t work today, Parsons and Turbinia gate-crashed Queen Victoria’s review of the Royal Navy’s fleet assembled at Spithead, outside Portsmouth, to mark the Queen’s diamond jubilee. 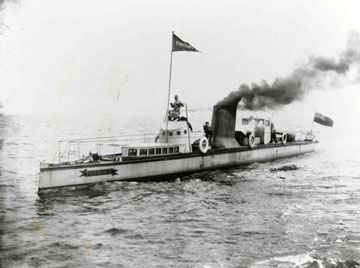 Turbinia easily outran the Navy’s patrol boats, and brazenly cruised at high speed between the great ranks of warships. 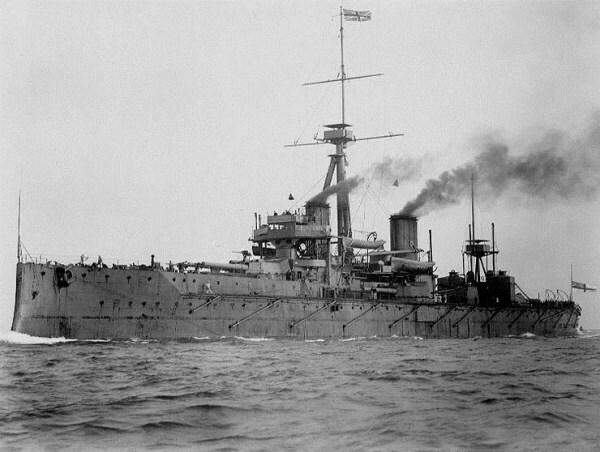 Parsons had made his point to the British Admiralty, and within 2 years the Royal Navy had two turbine powered destroyers, and by 1906, HMS Dreadnought, the most significant warship since the move from sails to steam, was in service, with Parsons’ turbines central to her success. 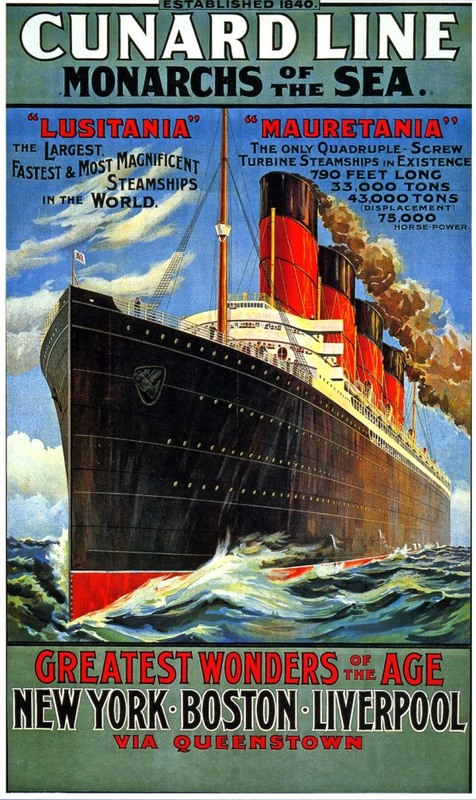 Cunard had always been close to the British Government, through Royal Mail contracts (hence RMS – Royal Mail Ship), and by 1902 another deal was done – the government would extend the mail contracts and lend Cunard the funds to build two liners capable of beating Kaiser Wilhelm der Grosse, and Cunard would ensure that they could be easily converted to military use, through fitting gun mounts. Such was the size of the new ships that they had to be commissioned from different shipyards – Mauretania from Swan Hunter & Wigham Richardson of Wallsend, and sister Lusitania from John Brown of Clydebank, near Glasgow. Swan Hunter was based at the Neptune Works on the banks of the Tyne; merger with local rivals Wigham Richardson and the recruitment of several leading and ambitious engineers and naval architects was driven by the desire to bid for the Mauretania contract, as was the 1903 takeover of the Wallsend Slipway & Engineering Company, who had experience with and a license to use Parsons’ turbines – as using turbines for the first time in a liner would ensure the new ship would eclipse the Germans, and justify the government funding. Mauretania’s credited designer is Cunard’s own Leonard Peskett. The liner’s profile was perfect – purposeful, with the swept bow promising speed, the raked funnels suggesting power without dominating the design, the beautifully shaped stern hinting at the style on board, and the traditional Cunard black, white and red colors setting off the shape to perfection. 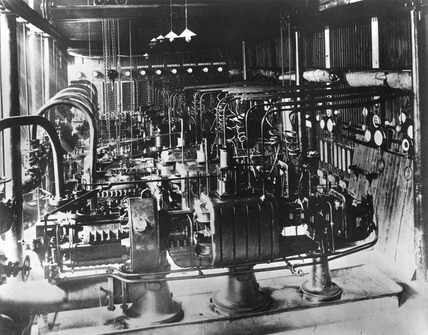 Peskett originally intended the new liners to have reciprocating engines, and it was only in 1904 that direct-drive steam turbines were finally chosen, influenced by engineers at Swan Hunter, notably Andrew Laing, and Parsons himself. This necessitated a rearrangement from 3 funnels to 4, giving Mauretania her distinctive profile, and helping with the well-judged overall proportions.. 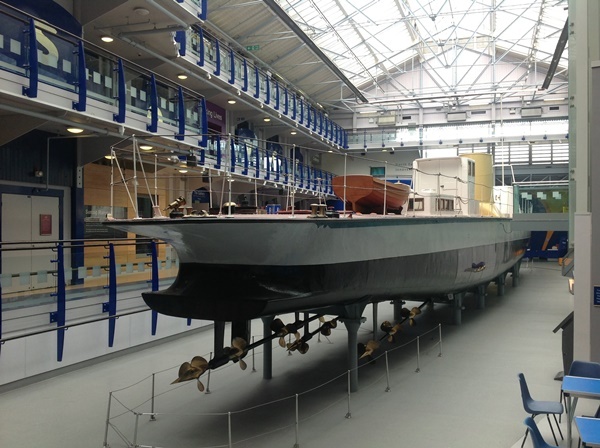 But much of the detail work was done at Swan Hunter, including building a 1:16 model, rather than the usual 1:48, to finalise the detailed design. and in September 1906, she was launched. 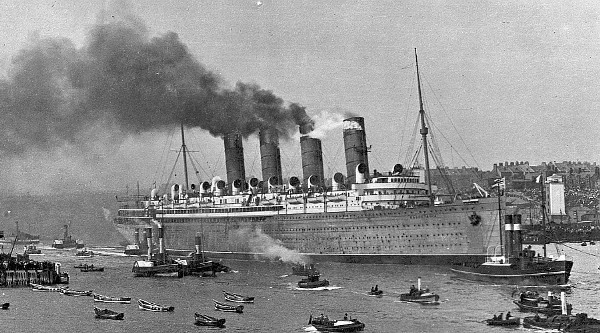 Overall, Mauretania was 790 feet long, 88 feet and had a gross tonnage of 32,000 tons. The turbines themselves came from the Wallsend Slipway and Engineering Co; this is the low pressure rotor, and its proud creators. Fitting out was complete in August 1907. 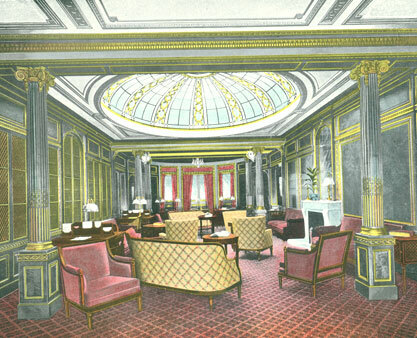 Mauretania’s interior was the work of Harold Peto, better known for work on grand English country houses. She was full of English woodwork, with details drawn from the styles of the Italian Renaissance, Louis XVI and the Scottish architect John Adam. The whole design was predicated about helping passengers (especially those paying the highest fares) forget they were at sea, and not in an upmarket London hotel or a country home in the shires. 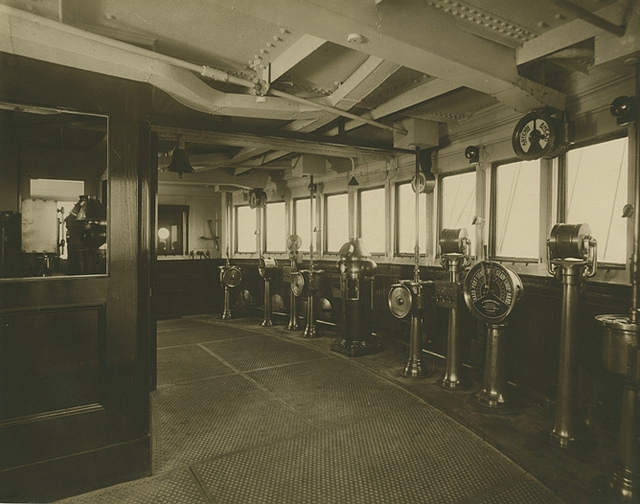 This is the bridge; on the deck below, an enclosed promenade deck gave passengers a sheltered but unobstructed forward view. 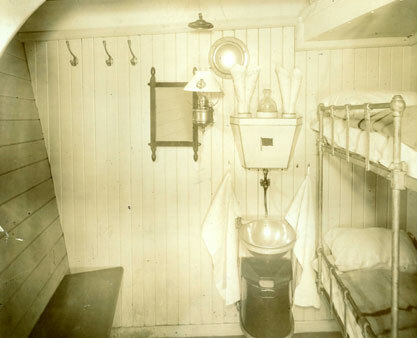 Third class accommodation was grouped around the foremast and first funnel. 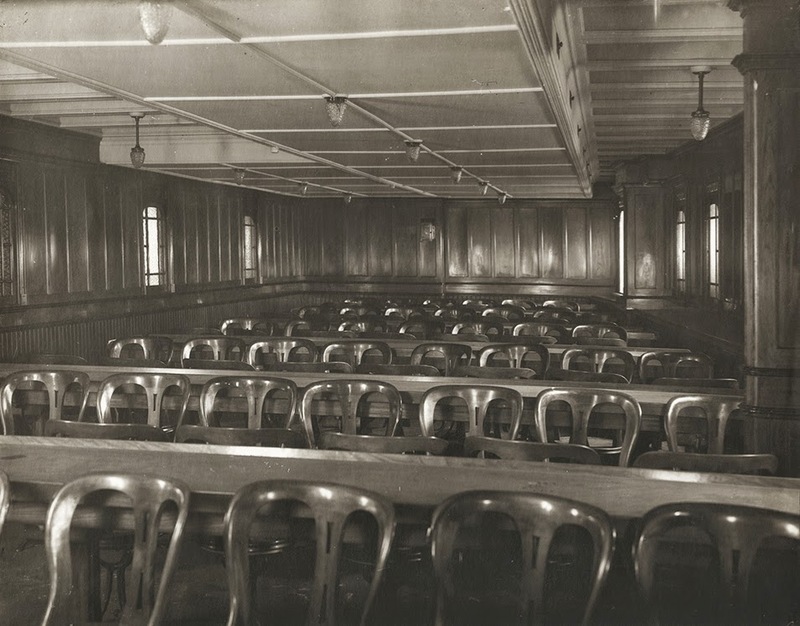 There was room for 1,100 third class passengers, now transformed from the old steerage, on four decks. 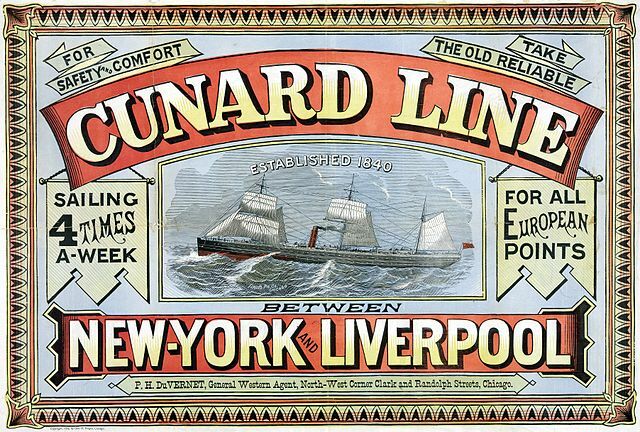 Cunard was not really in the immigrant market – speed and quality rather than volume was the driver – and it shows here. 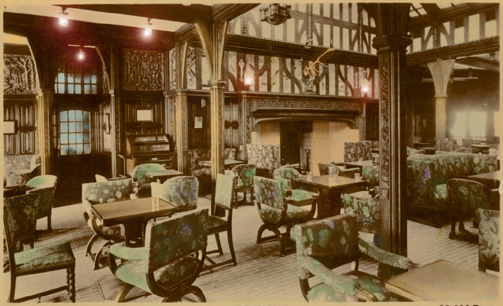 A dining room of polished ash with teak mouldings could seat 330, with revolving seats and arched windows. Second class was at the stern, across five decks, with the dining room featuring a 19ft high octagonal skylight, and accommodation for 460 passengers. The 560 first class passengers were accommodated in the centre of the ship, also over five decks. 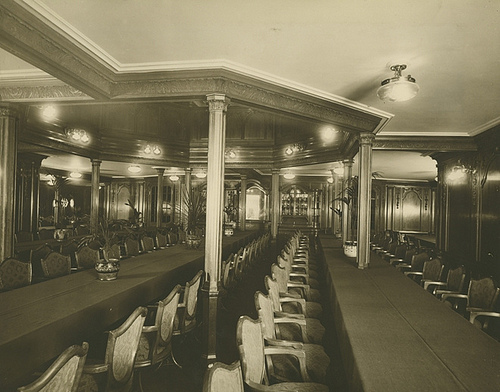 The first class dining room was right at the centre of the ship, to get the smoothest ride. This is the smoking room. There was no doubt, when she was completed, that Mauretania was the finest ship to grace the Atlantic crossing. Soon, she proved to be the fastest as well. 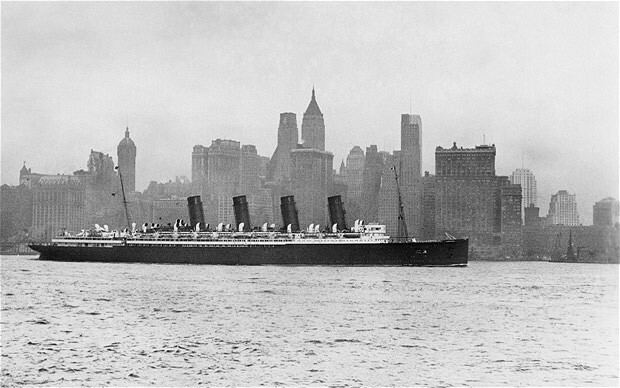 Her maiden Atlantic crossing was in November 1907, from Liverpool to New York; on the return, she claimed the eastbound Blue Riband with an average speed of 23.69 knots. 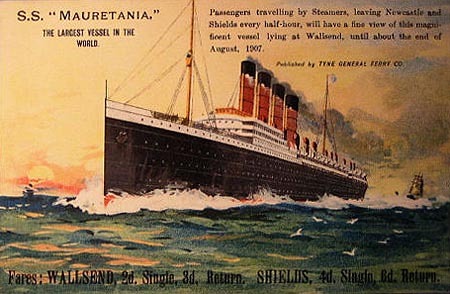 She took the westbound record in 1909 (from the Lusitania), averaging 26.06 knots and crossing from Cobh in Ireland to the Ambrose Light off New York in 4 days 10 hours and 15 minutes, and held it for 20 years – a record no other ship could match until the competition became obsolete in the 1960s. Mauretania was consistently faster than Lusitania, because her turbines had an extra set of blades and, from 1909, she was fitted with larger propellers with four blades. 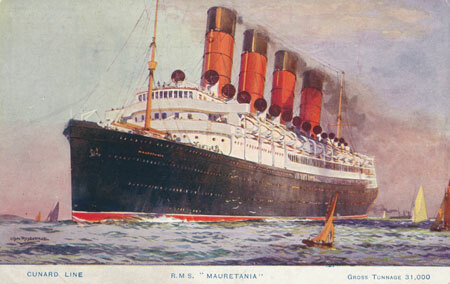 During the Great War, Mauretania was requisitioned by the Admiralty, and used as a hospital ship, exploiting her speed to evade German submarines. Lusitania was, of course, not so lucky, and was sunk by a U-boat off Ireland in May 1915 – the first time in 75 years that Cunard had lost passengers at sea. 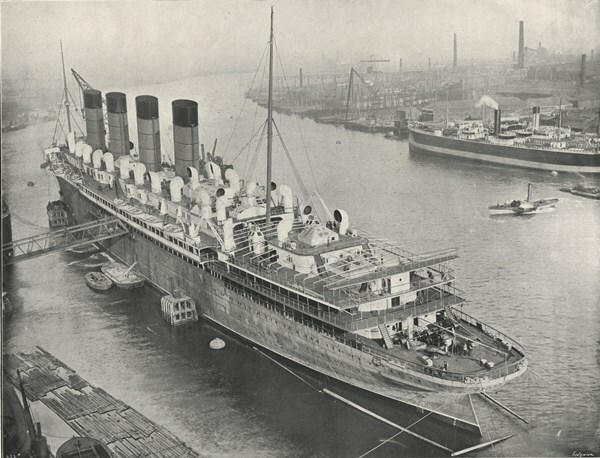 After the war, Mauretania was converted to burn oil, at Swan Hunters of course, and resumed her New York service, now from Southampton, not Liverpool, for easier tides and a shorter crossing, and with better connections to the Continent. She was no longer Cunard’s largest ship; Aquitania of 1912 held that honour, and the ill-fated Titanic and her sisters Olympic and Britannic of the White Star line were also larger, if slower. But right to the end of her Atlantic career, Mauretania was the fastest. Her last trans-Atlantic voyage was in 1929, still averaging over 24 knots. She ended her days as a cruise ship in the Caribbean and Mediterranean, before finally succumbing in 1935. But she still had her fans – Franklin Roosevelt wrote a personal letter to Cunard asking that Mauretania not be scrapped, to no avail. So what made her special? The size – the largest ship in the world; the speed – the fastest liner in the world for 20 years; the glamour of going to New York; the gorgeous shape; the stylish interior; the ambition of putting cutting edge technology into a flagship – all in all, she was the Edwardian Concorde, perhaps. She was broken up at Rosyth, under the Forth Bridge near Edinburgh, after this last visit to the Tyne to say farewell to the river – and to the people who loved her as not just ‘one of ours’. but as ‘the best we ever built’. Britain is a small place, but with strong regional identities and loyalties. 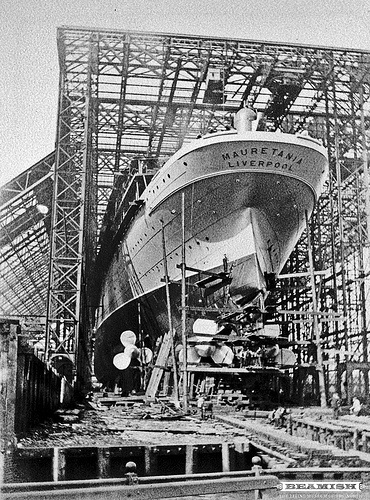 Liverpool is less than 200 miles from Newcastle, but Newcastle does not remember ‘Liverpool’s big fast ship’ – we remind you that Mauretania was engineered and built on Tyneside, because the technology, skills and capability could be found here, and nowhere else. Cunard may be associated with Liverpool, and the Queen Mary with the Clyde, but Mauretania – the liner that pushed the boundaries and set the standard – belongs to the Tyne. 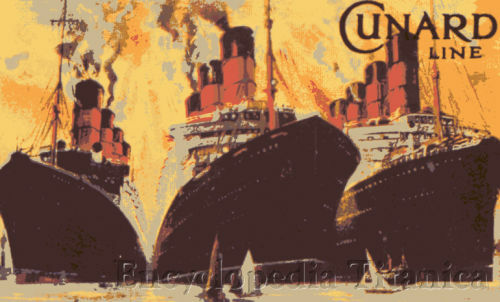 Uniquely for a Cunarder, there was a second Mauretania, such was the power of the name – a 36,000 ton liner styled to look like the larger Queen Elizabeth. She was equipped with Parsons steam turbines, of course, but she came from Cammell Laird at Birkenhead, on the Mersey, not the Tyne. She served until 1965. Today, there is no Tyneside shipbuilding left; Swan Hunter staggers on as just a consultancy business, but the rest is gone. But when we talk about ships, we remember Mauretania – the most significant and successful ocean liner of the 20th century, and the largest, fastest and best ship in the world – which is why this picture hung in the Quaterdeck of the QE2 throughout her years with Cunard, showing Mauretania leaving the Tyne in 1907 – truly, the Pride of the Tyne, then and now. A note on sources, outside the internet: The Ocean Railway, by Stephen Fox, is a well researched, well written and illustrated and very readable history of the 19th century trans-Atlantic passenger steamships, culminating with Mauretania, which he admires almost as much as I do. And on your next visit to Britain, try the Discovery Museum in Newcastle upon Tyne, for Turbinia herself and a great collection of Mauretania material, and Beamish, the Great Museum of the North. Superb. What a great collection of images and easy to understand for someone like me. Those tilted funnels; an ingenious visual implication of speed. Was this the first use of that idea? I know that on of the dining rooms or smoking rooms from the Titanic’s sister ship Olympic has been installed in a hotel in Alnwick, near Newcastle. Possibly a modern restoration and possibly colourisation of an original photo? Well done! Thanks for a very enjoyable read. Ocean liners are also quite a bit more robust, designed to take on the sometimes choppier mid-sea waters. I wish there were still more of them; even in the jet age, a relaxed trip between the US and UK with room for all the stuff I want to bring beats being squashed on a plane all day for me. Ocean liners have a much deeper draft (depth of hull) and more robust construction designed to take on the rough weather on the biggest oceans; cruise ships have wider, but much shallower hulls and are not designed for the open seas. They are also quite top-heavy and would easily capsize on the oceans. Significant differences. Truly a grand ship from perhaps the peak time of luxury ship building. While I’ve heard of the Mauretania, any discussion of ships from this time is too often eclipsed by the one that kissed the iceberg. Thank you for focusing on the Mauretania; these old luxury liners have long held a fascination for me. 75,000 horsepower? That is as captivating as the ship itself. > While I’ve heard of the Mauretania, any discussion of ships from this time is too often eclipsed by the one that kissed the iceberg. maneuvers in port or other close quarters. A simply wonderful, and accurate, write up. Thank you! An engaging and detailed read! +1 Love to see more from you too. Wonderful story, and a reminder of how fast technology was advancing during the Industrial Age. Outsized vehicles like the Mauretania, fitted with scores of castings that both dwarfed their human builders and twirled within micro tolerances are still hard for me to fathom. That these civil dreadnoughts still impress us can be seen in the bizarre, failed venture by eccentric industrialist Clive Palmer to quite literally float a pipe dream called Titanic 2, which would have appeared “identical” to the original. when it stops in New York. Agreed Barko, the photo of the turbine unit with the ancient car alongside is quite jarring. Overall I think people are quite dismissive of older technology, even things like mapmaking hold up quite well today. As for Palmer’s Titanic 2, I’ll believe it when I see it, Palmer has bigger problems on his plate at the moment. Thanks Big Paws for a great trip through a fascinating piece of history. 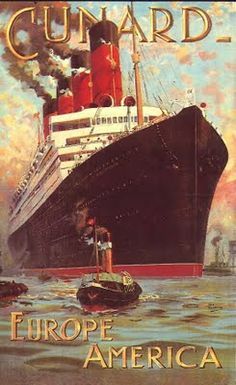 I recently finished a book about Lusitania (a 1973 book by Colin Simpson), which was a fascinating read, not just to learn about that ship’s tragedy, but about the intricacies of the deal between Cunard and the Admiralty to build these ships. It was certainly an unholy relationship, and reminds me of modern “Public-Private Partnerships” that seem corrupt from the beginning. 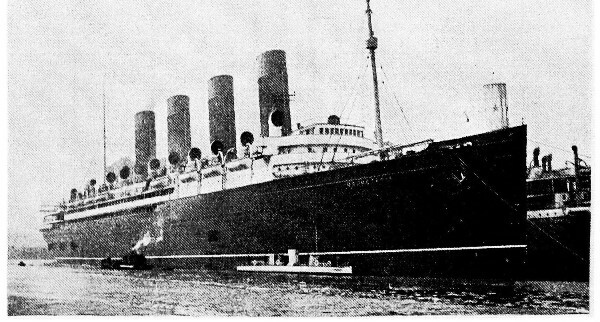 The fact that these luxury liners were easily able to be armed and converted to naval use is fascinating, although some observers note that the Lusitania and Mauretania were top-heavy (even for passenger liners), something which in reality made them ill-suited to naval warfare, and potentially contributed to the Lusitania’s quick sinking. I’m not qualified to judge the merits of that argument, but looking at these pictures, it does appear to be a top-heavy design, masked somewhat by the vessel’s sheer bulk. I loved your article on the Mauritania. It is a shame that her and a lot of the big liners were scrapped in the mid 1930’s, just prior to the outbreak of WW2. Had they had been able to hold on a few more years they would have been able to contribute to the Allies WW2 effort when they needed it the most in the early days of the war. Eric703, the US did the same thing with almost every big liner built in the US in the 20th century. They were built to specifications that up until WW1 that they could be converted to merchant raiders and after WW1 to easily to be converted to troopships. Nothing new or unholy about it. The SS United States was the last one to be built in the US with government subsidy. The tag line “Getting there is half the fun!” sure doesn’t apply to today’s travel. Although I’m not old enough, I sometimes yearn for the bygone days of elegant travel by train and ship. That said, thanks for the great write up. I learn something every day from y’all! Ships? like these, with speed, reliable service, & relatively inexpensive basic fares, made mass European emigration to N. America possible. The Boeing 747 is the aviation analogy. While Anglophones tend to think of British lines, & rightly so, Germans & other nations participated as well. Today’s Hapag-Lloyd, whose intermodal containers one sees on American railways, descends from two Victorian-era German firms which also operated ocean liners. My grandfather came here from Sicily on a German ship. A fabulous surprise for the day! Though I have never been aboard one, I love those grand old ocean liners. For 30 years, I have had a framed poster of the Aquatania on my office wall, and I never tire of looking at it. I had no idea of the technical advances that the Mauritania featured. It is easy to see why an Englishman would be proud of these, as well he should be. Awesome photos! Stories are a. good way to talk about an event, or vehicle, but pictures can tell just as much when combined with the story to make it more interesting. Agree with everyone – what a great story. 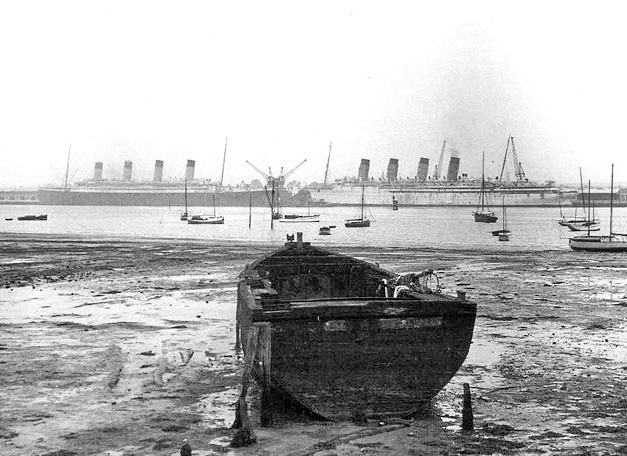 There are poignant pictures of the Mauretania and Olympic together, awaiting scrapping in 1935 (this one from Wikipedia). It would be wonderful to have an equivalent post on Olympic, which had an illustrious career almost as long as RMS Mauretania (and a heck of a lot longer than her sister ship Titanic), although she wasn’t as revolutionary as the Cunard ship. Count me in as a huge ocean liner buff. It should be noted that despite being “sister ships”, the Lusitania and Mauretania had a lot of differences. The Mauretania was longer and wider, and the two featured different style deck vents and had vastly different decor inside. 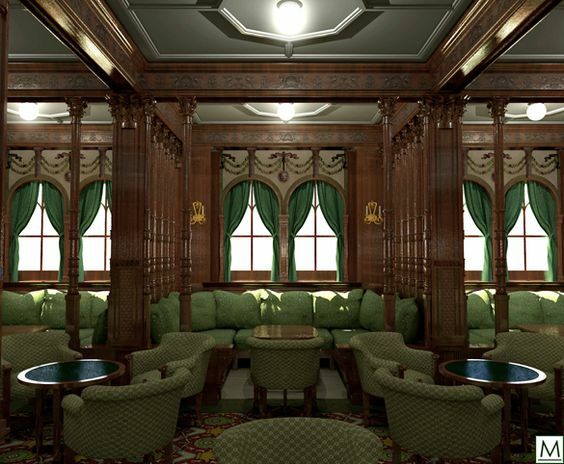 The Mauretania featured a significant amount of dark wood paneling and trim in the first class areas, whereas the Lusitania made use of white plaster. 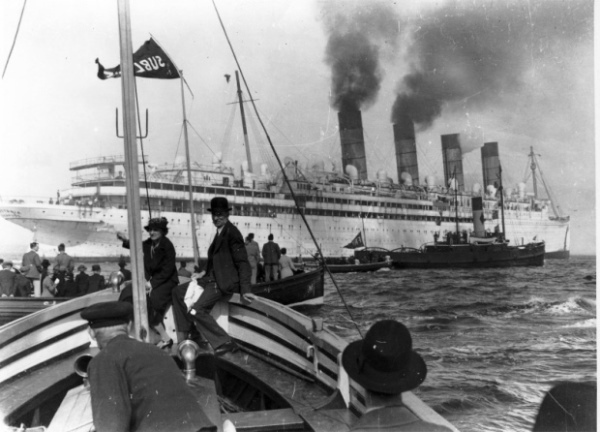 Despite being slightly smaller, the Lusitania had a larger passenger and crew capacity. Personally, I find the White Star Olympic Class trio to be the best balanced design, while I find the HAPAG Imperator Class to have the most palatial interiors. The smoking lounge decorated in the style of a Bavarian hunting lodge was pretty cool. I’m not really a ship buff, and in fact had never heard of this ship, but I did enjoy reading about it. Nicely done. Although this is not an article about cars, an article on another very impotant method of transportation, ships, is well suited on Curbeside Classic. I have always been fascinated with the history of the cruise liner. Next, I would like to see an equally in-depth article on the history of passenger airships (a.k.a. blimps). The Andrea Doria sinking has special significance for Mopar fans – a fully-drivable Exner-designed concept car called the Chrysler Norseman with a spectacular cantilevered roof supported only by the C-pillar was aboard in the cargo hold. It was built in Italy by Ghia taking over a year to build, and intended to be shown at American auto shows. It never made it there and only the specifications and three black and white photos remain. Keeping with the cars/sinking of ships theme, when the Lusitania was torpedoed in May 1915, onboard were twenty Trumbull cyclecars, and company director Isaac Trumbull, who was en route to finalise a deal for three hundred Trumbulls to be exported to the United Kingdom. Cunard had much better luck than over at White Star. Not only did White Star lose the Titanic on her maiden voyage, but her sister ship Britannic fared little better, sinking in 1916, a year after it was christened when it struck a German mine. Oooh – I have photos of Mom and a young me standing in front of the Flying Scotsman when it toured the USA in the 1960s. Happy to lend them if you want! yes please! My Flying Scotsman piece is almost ready – I just need some good photos of her return to York this weekend. A wonderful read, Big Paws. It’s a great gift to be able to write an article about something a person is not generally interested in, and make it not just interesting, but compelling. Well done! Fascinating! It is so interesting to read about a subject like this, not only for the precise technological feats accomplished before computers existed, but also for the insight about life and business in that era. Great read, I knew very little about the Mauritania before this, but I do know quite a lot about steam turbines I used to overhaul them at a power station and that photo of the creators of the low pressure rotor is mislabelled that is not a steam turbine rotor. Then what is it? It certainly looks like some part of the turbine. 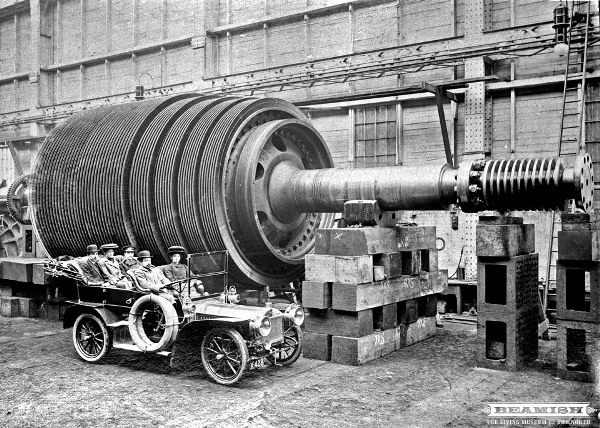 Maybe steam turbines have changed some since the very first ones. Sorry Paul I just looked up the original image its called a turbine ring and is labelled as such,which surrounds the rotor wheel and directs the steam onto the blades( we called them diaphragms and ours were in two halves. The completed rotor is the image with the car for size comparism the big low pressure turbine rotors I played with weighed 48 tonnes and were 12 feet across rebladed wheels were machined on a flatbed lathe with 84inch centre height. The rotor for one of the steam turbines is shown in the photo immediately below that of the model of the Mauretania, the one which shows the people sitting in the old jalopy alongside this massive piece of steel. Early turbines used relatively low pressure steam and were quite massive. High pressure steam was introduced in the 1930s and the size of steam turbines used for ship propulsion shrank dramatically. Power station turbines, although using high pressure steam, are still quite massive due to the amount of power they are intended to furnish. Yes that is the completed rotor with all the rings/ diaphragms installed ready to be sat into the lower casing, thats the main difference to the ones I pulled apart the rings remained in the upper and lower casings separate to the actual rotor. This was a very satisfying read. I’ve always been a fan of big steamships, and particularly of the Mauritania and others of her vintage. What an incredible accomplishment. One of the highlights of my life was touring the Queen Mary in Long Beach, CA. It’s hard to get a sense of how everything fits and works until one can explore the bowels. That’s certainly a great way to get a feel for the size, complexity and layout of these ships. I had a great day and disappointing pizza there some years ago. Pretty sure you couldn’t get pizza on the Mauretania! Great tour, wasnt it? I was particularly impressed by the reduction gearing and “power steering” for the rudder. While the 1930’s high pressure turbines werent that big, the boilers were still huge. Great article! Back in the 70’s, Jaques Cousteau did a PBS special detailing his dive down to Brittanic. Posters were distributed to schools to promote it. After it aired the teacher gave it to me as I was the only one interested in it. I had it for many years but along the way I lost track of it. I wish I still had it. When you look at the old motion pictures, the real old ones where everyone walks real fast, and you think about what these people accomplished with what was available at the time, you have to wonder if those people really did walk that fast. Nope, that’s from old silent movies that were usually shot at 18 frames per second being played on modern sound-movie projectors that run at 24 fps. Great post and learning experience. OT: Seems a shame that Cunard is now owned by Carnival. Simply splendid article, I say. What-what. this was a wonderful read and a pleasant surprise as my two great hobbies have been cars and ocean liners. my parents immigrated to Canada on the last of the great “4 stackers” as they were called, the Aquitania, in the late 1940’s. they both talked about the size and grandeur of the ship even though it was never converted back from its wartime role as a troopship. I still have many souvenirs from their crossing from the onboard newspaper to baggage tags. 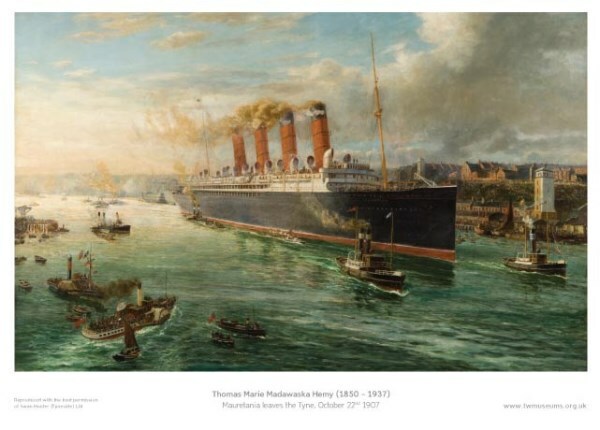 Nice article about one of the significant milestone in ocean liner history: the RMS Mauretania. However the Mauretania wasn’t the first large ocean liner to utilize the new steam turbine propulsion. Cunard launched two ships in 1904/1905: RMS Caronia and RMS Carmania to test turbine vs reciprocating engine technology. Both ships were about 20,000 tons, about 700 feet long and capable of 18 knots The Caronia used the conventional quadruple expansion reciprocating steam engine whereas the Carmania used the new steam turbine engine. The Carmania proved to be slightly faster, smoother, easier to maintain and more economical. As a result of the favorable Carmania experience, it was decided to equip the Mauretania and Lusitania with steam turbines. White Star Line, on the other hand was more conservative, with preference for luxury than speed, built the Titanic and Olympic with two quadruple expansion reciprocating steam engine supplemented with a center steam turbine engine. Still the Titanic was capable of 22/23 knots. The last surviving representative of an ocean liner built on the Mauretania heritage is the Queen Mary I. 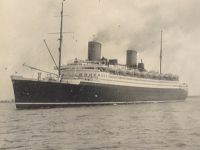 Launched in 1936, it was a tour-de-force 80,000 ton, 1018 ft long 30+ knot superliner, although somewhat of a throwback to the Maruetania/Lusitania/Aquitania design era as evident by the straight stem bow, deck ventilators and external cable-braced funnels. 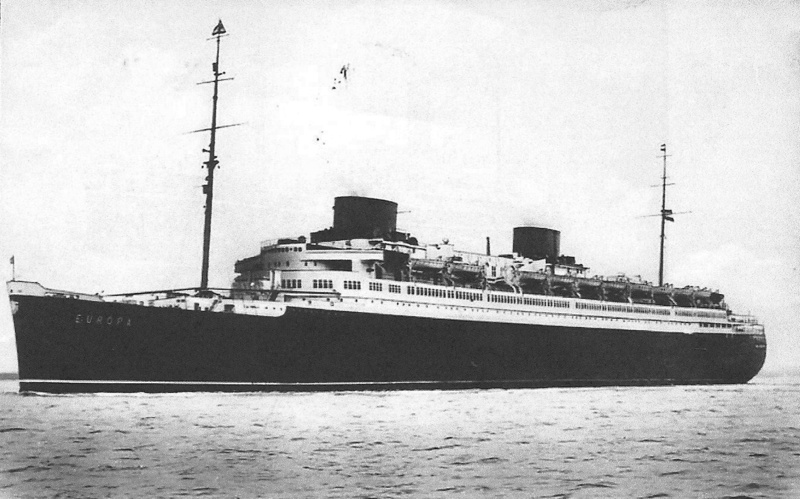 In contrast, the ill-fated French ocean liner Normandie, launched a year ahead of the Queen Mary, was more modern looking and utilized turbine-electric propulsion. A similar engine experiment occurred over at White Star with a pair of 1909 ships, the SS Laurentic and SS Megantic. The Megantic had two quadruple expansion recipricating engines, while the Laurentic got the same combination setup (two reciprocating steam engines with a steam turbine between them) later used on the Olympic, Titanic, and Brittanic. 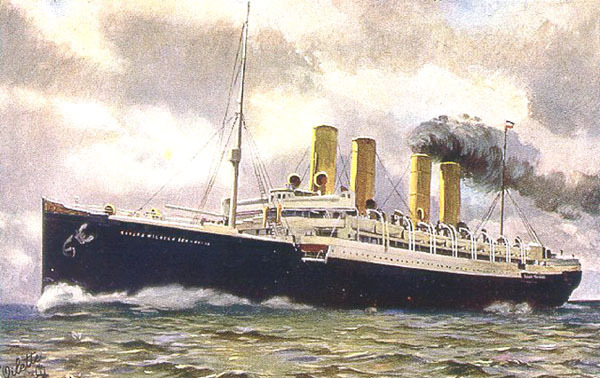 The latter arrangement not only proved more economical, but also is said to have run smoother and with less vibration than the turbine-only Mauretania and Lusitania. The Royal Navy conducted similar experiment in the 1840’s. They built a screw propeller ship Rattler. They conducted a series of tests including one where the Rattler towed a similar paddle wheel ship backwards while the other was in full speed ahead mode. Thanks for this – I didn’t know! Thanks for sharing your knowledge Halwick! Great article and very well researched – hope to see some more on these great ships. Thanks for this Big Paws, fascinating read and some beautiful images. I especially liked your phrase “Edwardian Concorde” sums up the Mauritania perfectly! I’ve also heard the stats about 1/3 in various forms, but always with the North East and the Clyde approx equal and with the UK producing more than half the world’s ocean shipping – so 1/3 each, perhaps in some peak period. I used to work with guys who did their time on the Tyne mechanical fitters who emigrated for a better life as the Geordie ship building industry slowly failed, interesting people and to me an interesting place. short funnels, and later heightened. What a great piece of engineering. I confess to not, at least for may years, been familiar with the Mauretania and certainly not familiar with the use of the steam turbine. That has to be the ideal power unit for luxury ship, surely? And I didn’t know the Lusitania was a sister ship either. I did know that the shipbuilder was linked to Armstrong-Siddeley though. There’s a great symmetry in this ship also – it marked the end of the industrial revolution. Newcastle, in the north east of England, was at the heart of the industrial revolution and its consequences from the 18th century onwards. The bulk extraction of coal, the development of the steam engine and then the steam locomotive and railways, the development of practical and safe electrical generating equipment (turbines again), the mechanisation of armaments and of course building big steel ships. A lot of this happened within 50 miles of Newcastle. 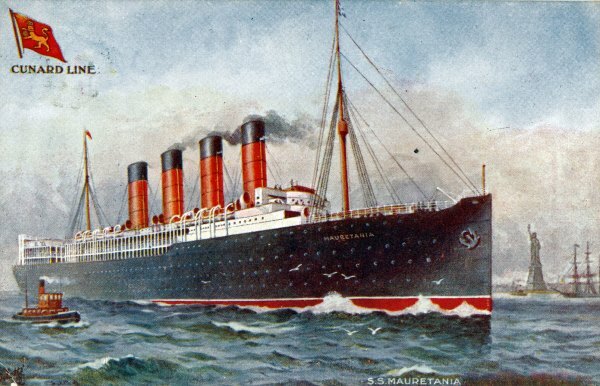 The Mauretania was launched close to the start of the first world war, which marked a change in many areas, not just the political make up of Europe. I would argue it marks the beginning of the communication age, with the coming of radio, telegram. and television, the age of flight and of personal car ownership, all areas Newcastle was much less well represented in. After the first world war, the north east of England went into a depression that endured at least until the start of the next war (Google “Jarrow March” to see what I’m thinking off) and arguably this is still enduring today. Looked at this way, the Mauretania could be seen as a milestone that marked the end of the first part of the industrial revolution, and did it with style, and technology. You missed the incandescenct light bulb, perfected in Gateshead by Joseph Swan. An interesting proposition – that Newcastle led the first industrial, heavy industry. revolution, but missed the second, consumer and technology based one. Two points to add – the North East peaked before the Great War, but couldn’t diversify afterwards – the Jarrow March (or Crusade) followed the collapse of the town’s shipyard (Palmer’s). And, in the mid 1980s (and perhaps beyond), Newcastle was the only British Univesity to offer degrees in both Naval Architecture and Mining Engineering. Wonderful article, Mr Paws, many thanks for it. We can still travel behind steam engines, fly in biplanes and drive in Silver Ghosts, but none of us will ever experience an Edwardian liner. 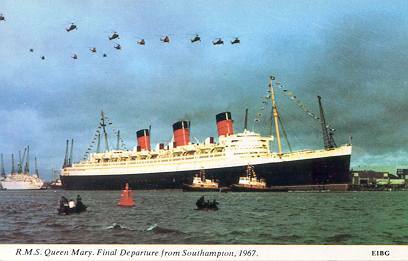 I was brought up in Hampshire, and on 31st October 1967 I was taken down to Southampton Water, alongside many thousands of others, to see the Queen Mary leaving her home port for the very last time. 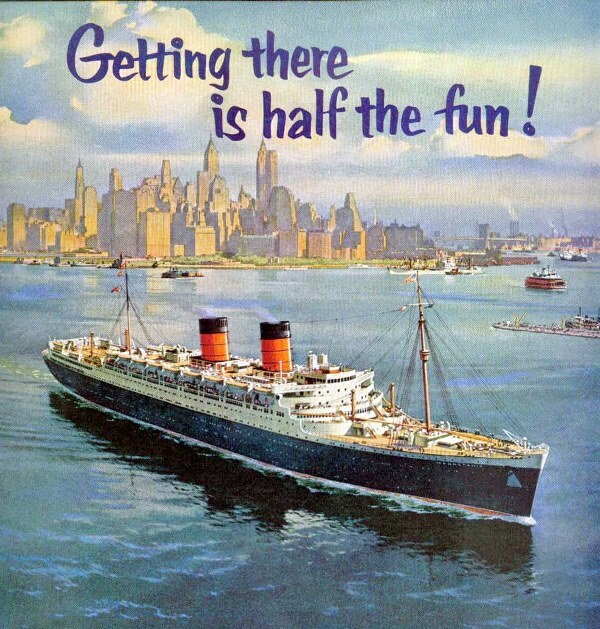 If ever there was an end of an era moment… At that time, the Union Castle Line was still running scheduled sailings to various African destinations, and of course the QE2 had been launched to take over from the Queen Mary and Queen Elizabeth on the north Atlantic route, but the old days were over. I was too young to assimilate Churchill’s funeral, 2 1/2 years earlier, but this was an “End of Empire” event that will always be clearly etched on my mind. Fantastic article! I’ve always found the great ocean liners to be an absolutely fascinating subject, but one I know comparatively little about. It seems like this would have been the ideal way to cross the Atlantic in a less hurried time. 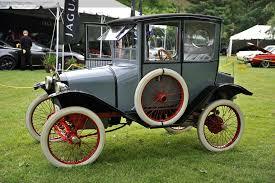 And the technology is absolutely amazing for over 100 years ago, especially in comparison to where automobiles and aircraft were at the time. Oh I say! Jolly well done old chap. Ships like the Mauretania and the battleship Dreadnaught are the reason why Brittania ruled the waves. In the mid-sixties, the father of Tom, one of my school friends, built a swimming pool in the back garden of the family home in Glenrothes, Fife. Tom told me with a certain amount of swank that the steps came from the Mauretania, although it must have been the second one rather than the original. Standing on those steps was about as close as I’ve ever made it to a transatlantic liner. Rosyth Dockyard where these ships were scrapped was just over twenty miles away. How did the ships with the turbine engines reverse? 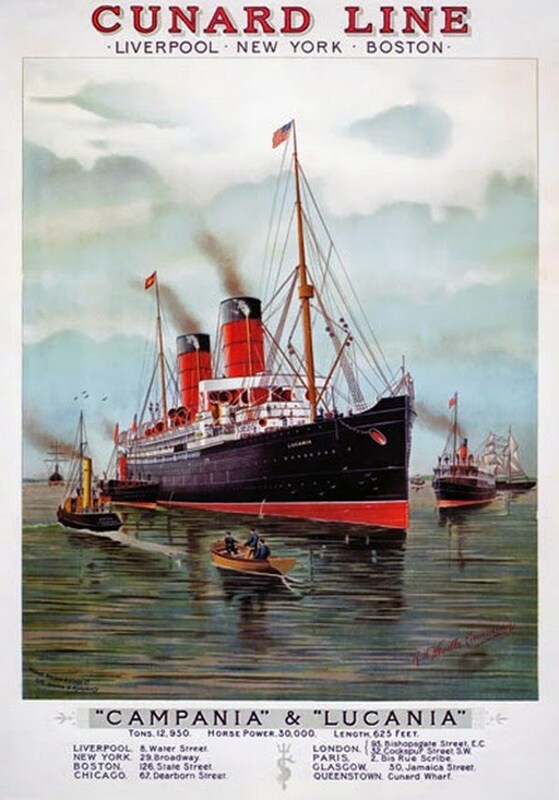 You said that it was rare for a Cunarder to give a ship the name of a predecessor….IIRC, Franconia, Andania, Alaunia, Caronia, Carmania, and I am sure I missed a couple – all of these names were used more than once by Cunard.